“The Queen is dead”. These words rippled across the world soon after they were posted on the research website of desert lion researcher Dr Flip Stander, www.desertlion.info on Sunday 18 May 2014. Fierce, proud, fearless. Known to take on grown male lions in order to protect her cubs, she did not shy away from a fight, whether with a grown Giraffe, or a male lion. 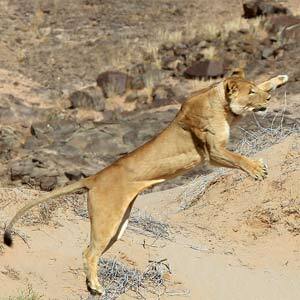 Her contributions to the cause of desert lion research was immense. 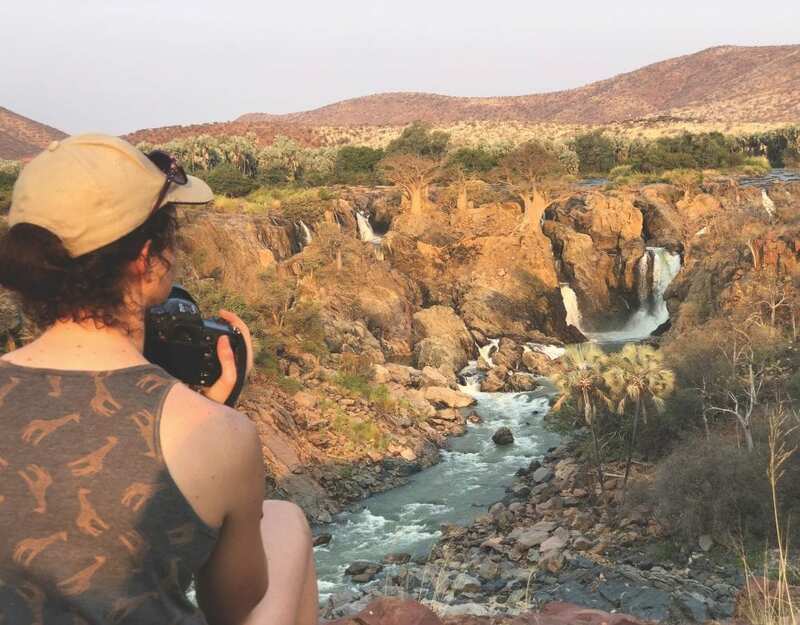 Not only on paper, but in the fact that she was solely responsible for the re-population of lions in the Hoanib river, Hoaruseb river and the Hoanib flooplains of the Skeleton coast. There were no lions in those areas before she moved there, settled down and her off-spring began leaving their footprints in the soft sand of the river beds. 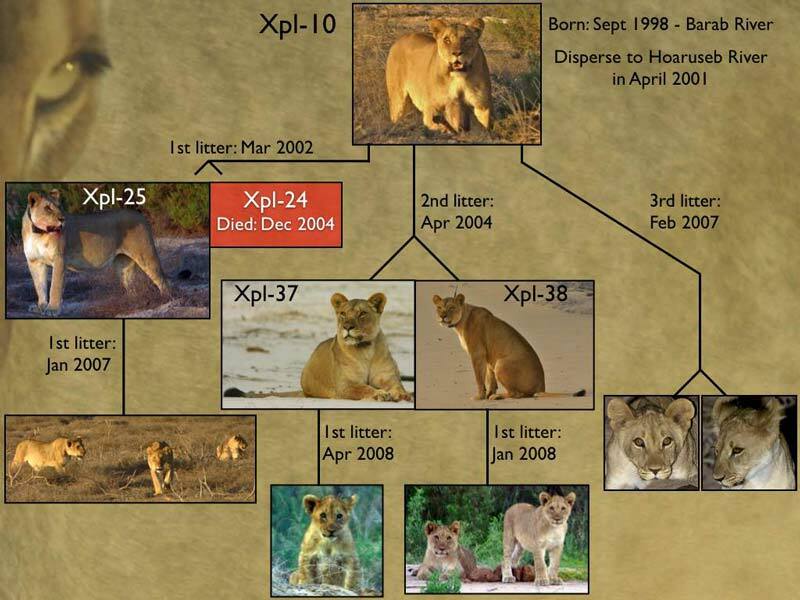 Xpl-10, as she was known to the lion researcher Dr Stander and his dedicated team and thousands of his and her fans throughout the globe, was born in September 1998, alongside three male cubs, at Aub Canyon, near Palmwag. The average lifespan of lions elsewhere in Africa is approximately 12 years, but the fierce and proud lioness exceeded all expectations and lived four more years than the average savannah lion. Through her long life, the Queen produced five litters and had a total of 13 cubs, an average litter size of two cubs. Her successful reproduction rate soon led her to be given the nickname “The Queen”, the one who ruled over the Skeleton lions, the one who gave birth to a new generation of rare desert lions in these deserted and harsh unspoilt environs. Her death this month was as natural death as a carnivore and predator in the wild can expect. Following numerous claw on claw encounters with male lions in the area, one too many encounters left an infection that her frail body could not overcome. But she left this world, closely watched over by her lion family, and of course, the researcher who has watched her closely throughout her life. Xpl-10 leaves behind a healthy generation of desert lions and a legacy as a fearless and fierce protector of her young, a desert lion whose legacy reflected the spirit of all desert lions as many imagined them – proud beasts capable of ably carving out a living in one of the harshest, most unforgiving wildernesses in the world. 13 May 2014 – After spotting her in a very poor condition close to a human settlement, Purros, the research team darted her and returned her to her pride the Floodplain lionesses and the Five Musketeers, five young cubs. The decision to reunite her with her pride was made after members of the community indicated they were not pleased with a lion being so close to the settlement. 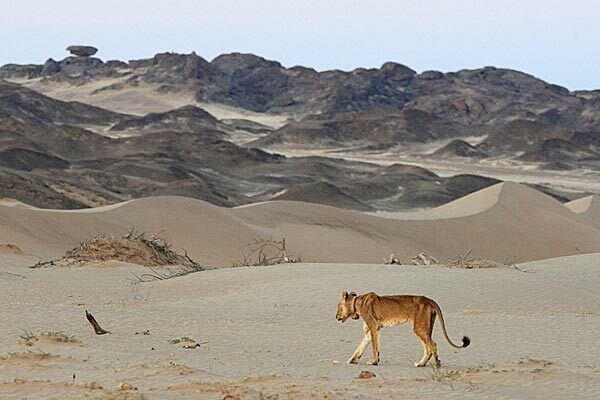 14 May 2014 – on this day, the researchers of the Desert Lion Conservation project indicated that the Queen “appears to be making a recovery of severe food deprivation that most of the lions in the western section of the desert had to endure when the wildlife dispersed after the high rainfall”. 16 May 2014 – Although the lioness had fully recovered from her translocation, and had eaten her fill her condition remained critical. 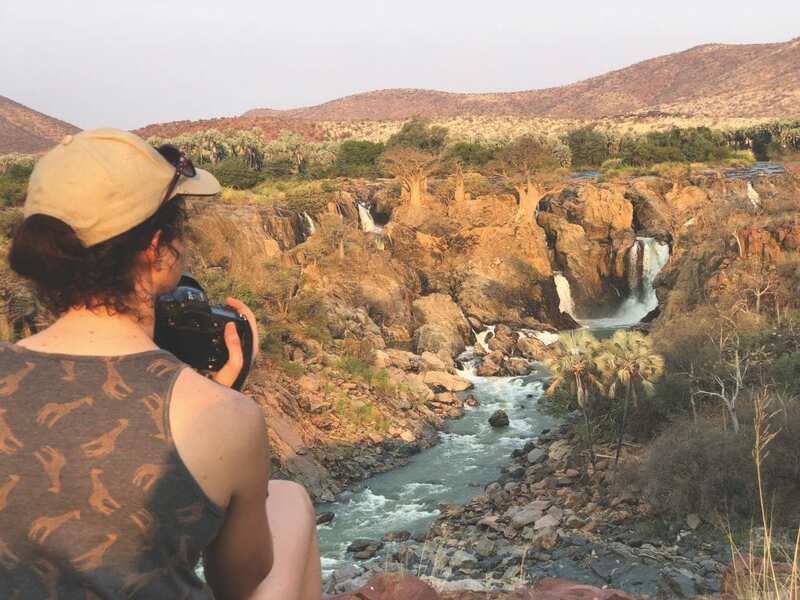 Dr Stander and his team remained aware that she might not recover “from her desperately poor condition and the injuries she sustained to her lower spine and pelvis”. 18 May 2014. The “Queen” is dead. Xpl-10 died at 13h26 yesterday afternoon. The events during the past 48 hours leading up to her death were both traumatic and fascinating. Xpl-10’s condition deteriorated during a raging sandstorm that lasted more than two days. The rest of the Floodplain Pride moved westwards during the night, but her daughter (Xpl-69) stayed behind and remained close to Xpl-10 until she died (photos: top & second row left). An autopsy was performed on Xpl-10 at the Wilderness Safaris Hoanib Camp. 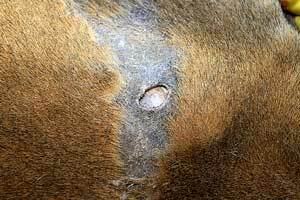 The preliminary findings show that a puncture wound (probably caused by the canine of another lion) on her lower spine/pelvis caused a major infection and possible damage to her spinal column. In addition, her kidneys were enlarged and may not have functioned properly. The right kidney was solid and much larger than the left. The carcass of Xpl-10 will be processed and her skeleton will be reconstructed and placed in the Hoanib Camp Research Centre or in the Mowe Bay Museum. Oh what a special, beautiful and tough lioness who has all my respect for her remarkable life and survival in such harsh conditions. 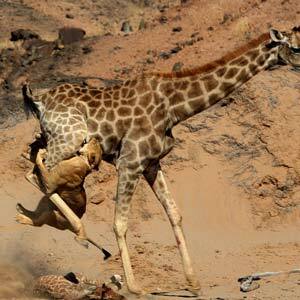 Hopefully her daughters will follow suit and keep the desert pride strong. RIP, beautiful girl – you deserve it! I so appreciated this story and magnificent pictures. Truly amazing look at a truly amazing animal! I came across the stories about the pride online and wanted to hear more about what happened to the old lioness, thanks for providing such moving stories. That’s not what we see in the documentary…what really happened? Did she die alone or her daughter wad really by her side at the end? 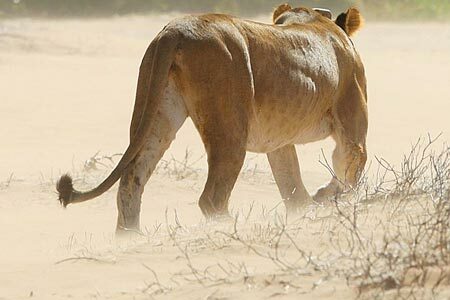 As recorded by the researchers following the lions, the daughter was in the vicinity close to her mother when she died.